Prepare and bake cake mix in a 13 x 9 inch pan, according to package directions. Let cake cool. Crumble cake into a large bowl, add cream cheese and stir until the mixture is well combined. It should be moist and hold together after forming a ball of cake with your fingers. If the cake mixture remains dry, stir in more cream cheese to achieve the desired consistency. Using a small cookie scoop, or your hands, portion small balls of cake and roll between your palms until nicely rounded. Place cake balls on a baking sheet covered with aluminium foil. Place sheet in the freezer for at least 30 minutes. Melt white chocolate in plastic bowl over bioling pan of water. Do not let the bowl tocuh the water. 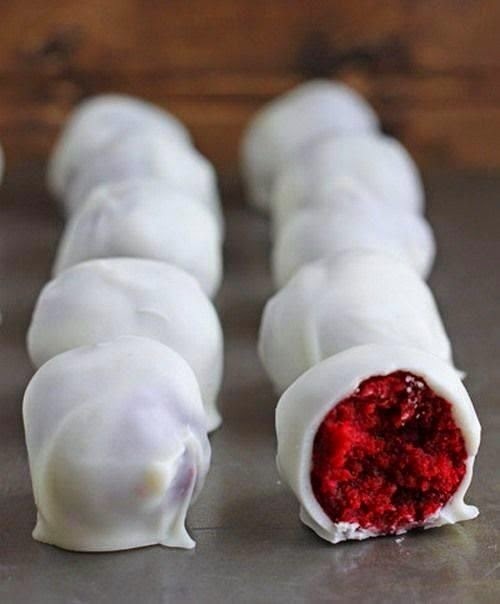 To coat, rest a cake ball on a fork and spoon melted white chocolate over top. Tap handle of fork on the edge of the bowl to allow excess coating to drip off. Place the dipped truffle on the foil-lined baking sheet. Repeat with remaining cake balls. Refrigerate truffles to set coating completely, about 20 minutes. Store in a resealable container or plastic bag in the refrigerator, up to one week.